When you shop for shoes to play racquetball, you’ll make sure that you’re getting the right type of shoe. The high-intensity sport has you switching often from backward to forward to lateral movements. The courts that you play racquetball on have a protective polyurethane coating. So, not any shoe will do for racquetball. For Men’s, these are the best options when it comes to racquetball shoes. Some people consider wearing court shoes indoors, but that is not advisable. Tennis shoes don’t have a good grip on indoor courts. 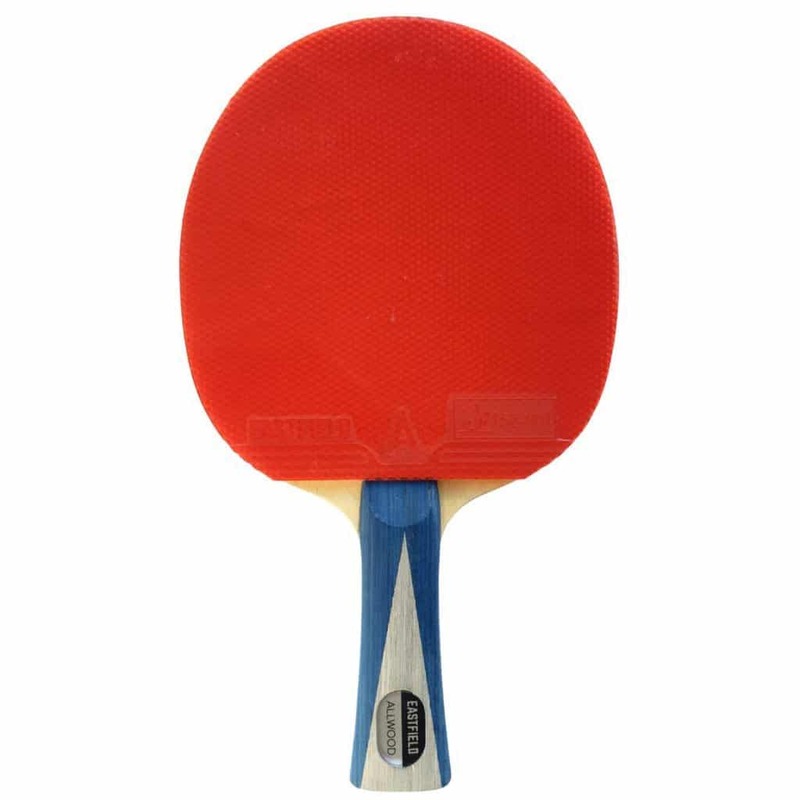 They are designed to be played on surfaces with a lot of friction. So, if you wear tennis shoes indoors, you may find yourself slipping. Walking and running shoes are not meant for the intensity of racquetball either. You have to make fast stops, turns or pivots and often make lateral movements in racquetball. Running shoes are designed for moving forwards. They have thick padding in the soles for absorbing impact. There’s not a lot of support for the ankles in running shoes. If you play in them, you could end up rolling your ankles. Racquetball is played indoors. If you can’t find shoes specifically meant for racquetball, you could wear volleyball and basketball shoes too. These sports are played on similar surfaces. They also involve many similar types of movements. But it is always best, if you can, to buy a pair of shoes meant specifically for racquetball. The shoes that are designed for racquetball have rubber gum soles. You may find them to be more comfortable. Plus, top shoe brands keep coming up with new technologies for better comfort and performance. 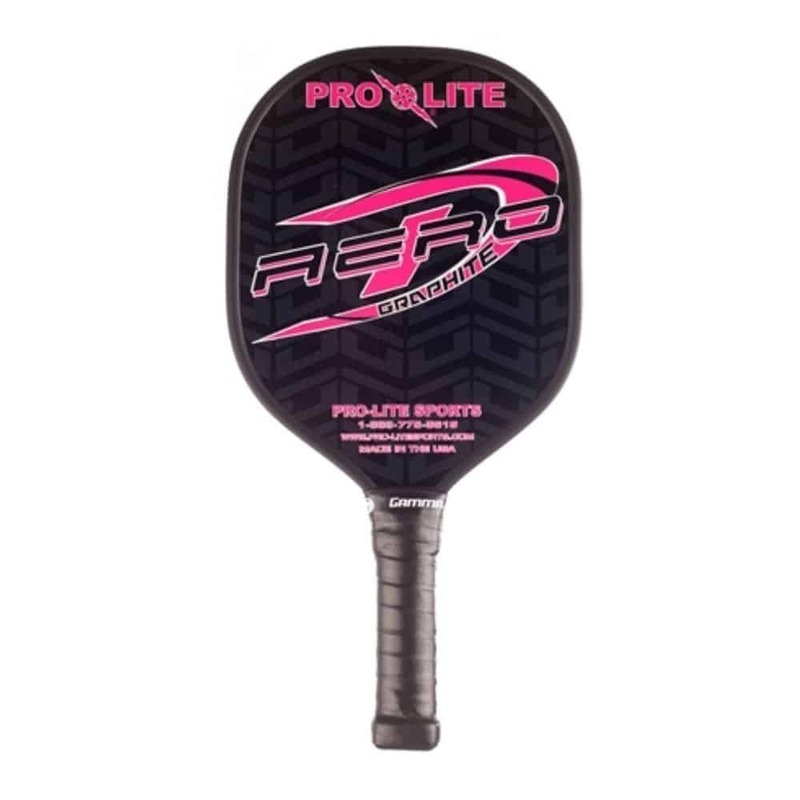 If you are serious about your racquetball game, then you should invest in one of these. It is important to ensure that whatever type of shoe you buy, you should only wear them indoors. Never wear them outside. The gum soles could be prematurely worn out. Your shoe could collect a layer of dust from being outdoors. This could make you lose a lot of traction, and cause you to slip. If you have pebbles stuck at the bottom of the shoe you’ve worn outdoors, you could end up gouging the court with it. Loose pebbles that someone has brought indoors can also make someone else slip. It’s best to keep a pair of shoes separate for indoor use on your racquetball court. If you are careful to keep the shoes that you wear for your game indoors, you’ll find that they can last years. A pair of good quality racquetball shoes that you’ve never worn outdoors can last for a decade or more. Among the many racquetball shoes in the market, there are some which surpass the others in terms of comfort, stability or traction. Brands like Ektelon have developed special technology for better comfort. Adidas and Asics have developed special shoes for racquetball. 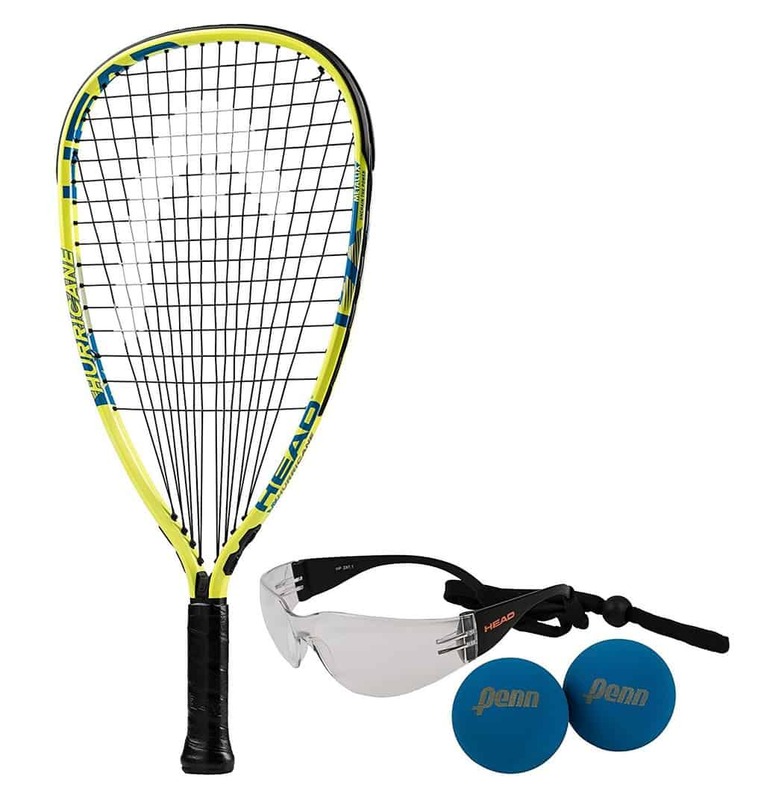 HEAD is a popular brand for racquetball gear and footwear as well. When you have many choices, how do you choose? 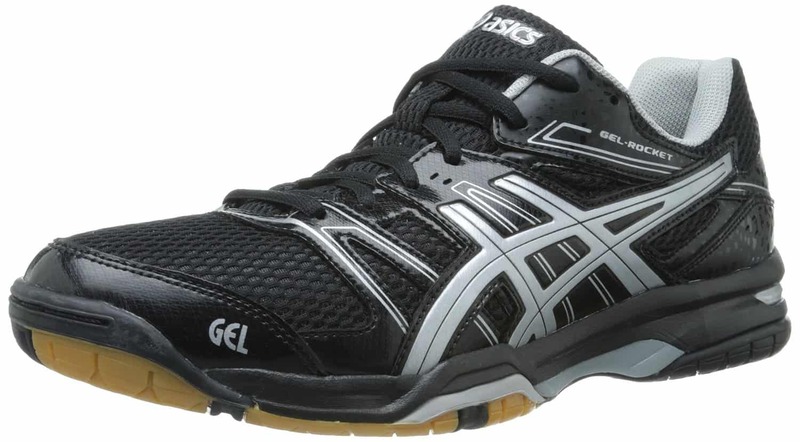 We’ve rounded up five shoes that men will find comfortable for extended games of racquetball. Ektelon is known for its exclusive racquetball shoe technology. The NFS (Natural Foot Shape) technology is designed to be wider at the front of the shoe so that there is no danger of toe jam. The shoes are narrower at the back for more stable support. The outsole is made of gum rubber, and helps to provide traction on the racquetball court. The men’s classic MID shoes feature Ektelon’s NFS technology. The shoe has a squared toe box and is a mid-cut, which offers better ankle support than low-cut shoes. The square toe prevents irritation in the toes, and you can experience its advantages after extended periods of play. The shoes fit best on people with feet that are medium to wide, who have trouble finding shoes that are wide enough for comfortable play. The shoe has a soft synthetic leather and mesh upper that is comfortable right out of the box. A soft collar and tongue help to support the ankle better and provide more comfort. The good support in the back prevents Achilles heel pain. However, if you have any existing issues with your ankle, you may want to go for a shoe that is cut higher and offers even greater support to the ankle. You’ll find that the traction and support that the Ektelon Classic MID racquetball shoes offer are reliable. If you play actively and move around a lot on the court, changing directions frequently, you’ll find the shoes support your movements. The racquetball shoes feature a speed lacing system. You can quickly tighten and loosen the shoe for sliding your feet in and out easily. The shoes last a long time, as long as you don’t wear them outdoors. If you wear shoe inserts for taller arches, you can comfortably slide in inserts into the shoe. The Ektelon Classic NFS racquetball MID shoes are not designed for narrow feet. If you have medium to wide feet and are looking for comfortable footwear to play racquetball in, then you’ll be well pleased with this pair. 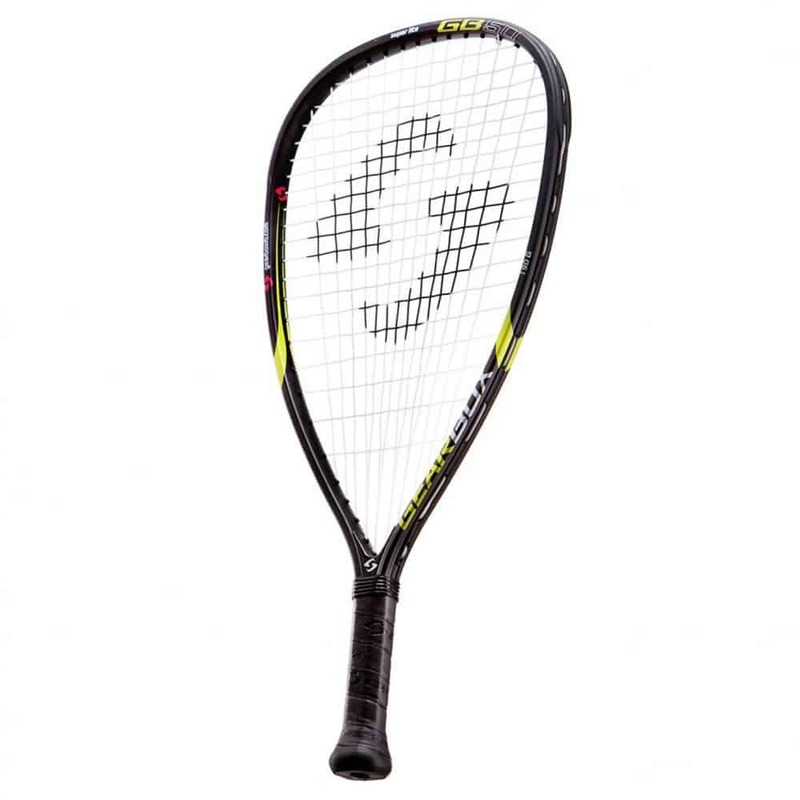 The Sonic 2000 Mid indoor shoe is designed for squash and racquetball by top racquet sports brand HEAD. Like the Ektelon Classic, this shoe has a leather and mesh upper for comfortable, breathable wear. The heel counter is pre-molded for better comfort and for stable support while you engage in an intense game. The tongue is also made of breathable mesh for comfort. The Sonic 2000 features HEAD’s proprietary gum rubber sole for greater durability and traction. The sole is designed to perform smoothly on indoor courts, hold up to lateral movements and quick changes in direction. It is also gentle on the indoor court surface. 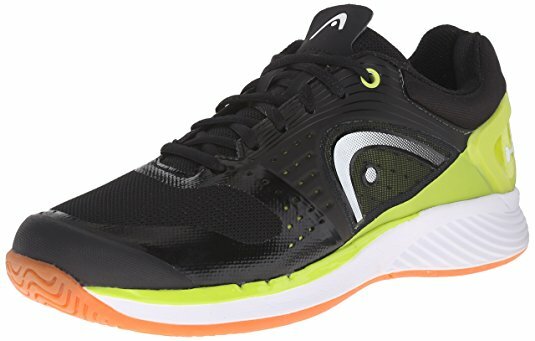 Overall, the Sonic 2000 is a solid shoe for racquetball by HEAD. It has a good grip, and since it is mid-cut, it offers good support for the ankle without being uncomfortably stiff. However, if you have issues with your ankle, you may want to wear an ankle strap or look for a shoe that is cut higher. Adidas doesn’t make shoes particularly for racquetball, but many users have found the Barricade Club tennis shoes works great for racquetball as well. The shoe is good for an indoor court because of its rubber sole. It features some special technologies to make it comfortable to wear on the court during intense sports. One of the special features of the shoe is the Adiprene cushioning under the heel. Adiprene is a proprietary development by Adidas that is placed in the midsole of a shoe for better cushioning for the forefoot and the heel. You’ll find it in many casual footwear for Adidas as well. But in a tennis shoe which you can use to play indoor racquetball, the material helps to protect your feet from the intense action of racquetball. Another technology in the Barricade Club shoes is the Torsion system that is placed in the outsole. This technology is a thermoplastic arch support that will help your rearfoot and forefoot move independently without straining. Because of this technology, your midfoot will easily adjust to the ground and give you excellent stability and support across a range of movements. When you’re playing racquetball, the Torsion System acts as a light bridge between the heel and the foot. No matter how actively you move your feet backwards, forwards and sideways mid-lunge, this midfoot support will help to prevent your arch from flexing incorrectly. If you don’t want to spend a lot of money on your racquetball shoes, then the Adidas Barricade is a good option to consider. It contains solid Adidas techs for good foot support in high-intensity sports that involve a lot of movement. Overall, the Barricade is a great non-marking shoe for the indoor racquetball court. This is another shoe from HEAD that we have included on our list for a reason. The Sprint Pro indoor shoe is designed for use on indoor courts. It has a rubber sole for that reason, and the gum rubber outsole is non-marking. The outsole is made from natural gum rubber, which is one of the reasons why the Sprint Pro features on the list of top indoor shoes for racquetball. The shoe is based on HEAD’s Micro-Fit technology. The design has a wide forefoot, which offers plenty of wiggle room for the toes. The midfoot and heel are designed to be snug and comfortably cushion the feet. The shoe features a piece of a perforated layer of ethylene vinyl acetate at the core. This layer helps to mold the shoe for the perfect fit and for good stability. The heel features thermoplastic polyurethane. The material offers solid support, which is further strengthened by the rubber protection. The tongue is made of breathable mesh for greater comfort as you play for long hours. The shoe looks great and while it may feel a little stiff when it comes out of the box, they are easily broken in after a few games. Overall, the HEAD Sprint Pro is a great indoor non-marking shoe for racquetball. While it isn’t cheap, it is still priced in the sub-$80 range. If you’re serious about racquetball, and you want a shoe that is comfortable and offers the kind of support you want in a racquetball shoe, you can try out Sprint Pro. 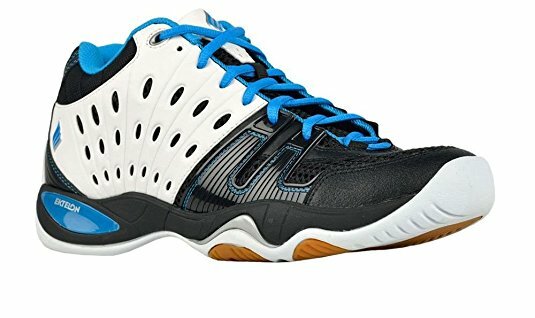 Ektelon’s T22 Mid racquetball shoes are designed to be lightweight, comfortable, and cushioning with excellent traction. The shoe is the most expensive on our list, at a little below $100. But if you’re serious about your game, then the T22 Mid shoe is worth the cost. It comes in a striking black, white and blue design with an edgy mid-cut form. The mid-cut design offers more support than a low-cut shoe would. The synthetic upper is lightweight and easy to break in. The tongue, vamp and quarter are made of air mesh for breathability and great comfort over long hours on the court. The outsoles are gum rubber, and help to provide great traction indoors. The sockliner is made of PU and adds additional cushioning and better support to the foot. The ShockEraser insert in the midsole absorbs impacts to the heel during intense action. The shoe is marked for both indoor and outdoor play. But it is recommended that you use it exclusively for indoor or outdoor use, for longevity and better performance. 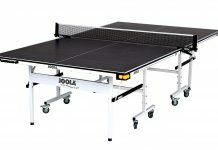 If the price is not an issue, you can safely purchase the Ektelon T22 and enjoy hours of play on your racquetball court. The shoe fits true to size, which is more than can be said for some of the other shoes on this list. You’ll find the shoes comfortable, supportive and attractive on the court. Overall, a highly recommended shoe for recreational and pro racquetball players. What shoes would you recommend for a player that wears a size 11 4E?